With comic book movies being released every other weekend these days, the world of superheros has never been more prevalent in our culture. Enter the History Channel and A&E with their perfectly timed new series “Stan Lee’s Superhumans.” To be sure this exciting series reveals itself to basically be a reinvented “Ripley’s Believe It or Not” by the end of the eight-episode first season. But the people profiled here more than make up for the slightly overdone title – for the most part they really are superhumans. From the Houston man who can bend metal and hold back a motorcycle with his hands to the samurai who can cut a beebee pellet in half after it’s shot at him to the Indian man who can conduct electricity through his body without being harmed, there’s more exciting feats of human uniqueness than you can fully comprehend. The series is narrated and led by Daniel Browning Smith, known as the most flexible man in the world (I was honestly disappointed he wasn’t fully profiled in an episode, but oh well). Stan Lee also makes a few appearances each episode from behind a desk, reminding the viewer why his name is attached to the show. Smith and Lee manage some decent banter, but Smith’s personality is really the big selling point of the show as Lee mostly reads stiltedly from a teleprompter. As Smith travels around the world interviewing and helping with experiments on the various supposed “superhumans” his presence serves to ground the show with a light-hearted but inquisitive tone that does the people being profiled justice. Though there’s some question in my mind about the “super”-nessÂ of some of these people (a guy who invented a solution to attract bees, a guy who claims to predict the future, and a guy who says he can knock people down with his mind) most of them actually are physically different than the rest of us. Whether their skulls are thicker (The Human Anvil) or their bodies don’t produce lactic acid when they run (Dean Karnazes, the Ultramarathon Man) or they have skin that can be stretched to incredible lengths (“Rubber Band Man”) these people were actually born with physical traits that make them different and “super”human. Most of the pleasure in this show comes from watching Smith revel in the discovery of these people’s not-so-hidden talents. Though he sometimes overdoes his enthusiasm there’s plenty to be excited about and he’s the perfect choice to host a show like this. I watched all six hours of Season One in one sitting (I guess I’m not very superhuman myself) and I was thoroughly entertained throughout. If they plan a second season, I just hope they leave out some of the less impressive types and bring in more people like “Quick Draw” – a man who can draw his gun and shoot a target “faster than a rattlesnake.” Also, is it too much to ask to find a superhuman female? 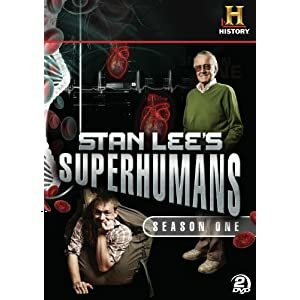 No user commented in " DVD Review: Stan Lee’s Superhumans Season One "